Diet & Nutrition Salt: friend or foe? Do you avoid adding any salt to your food because it’s bad for you? I did this for years but it turns out I wasn’t doing myself any favours. Salt is actually a vital part of our diet and it’s important that we include the right kind of salt in the right amounts. Find out all that you need to know from this recent article of mine for Natural Health magazine. We’ve been told for so long that salt is bad for us that I, for one, have spent most of my life avoiding it. Both the British Heart Foundation and the American Heart Association recommend no more than one teaspoon of salt per day. Any more than this they say, may raise blood pressure and increase the risk of developing coronary artery disease. Apart from making food taste better, salt has a number of benefits in the body, particularly in terms of controlling fluid balance and enabling normal muscle function. Nutritionist Fleur Borrelli also quotes research which suggests that the body may draw salt to infected areas of the skin as a sort of ancient strategy to protect against bacterial infection. She adds that it’s been hypothesised that our hunter gatherer ancestors, to whom we are genetically similar, died of infections because of the lack of salt in their diet. They would typically have had only 680 mg of sodium per day in their diet compared with our 4 to 14 grams. In the meantime, I’ve discovered pink Himalayan salt which I now add to my food on a daily basis. Am I taking a risk? Well the thing is, as with most foods, there’s the wholesome version and there’s the processed version. Processed foods are just plain bad and they’re chock full of processed salt. There’s a BIG difference between processed salt and natural salts like sea salt or Himalayan salt. 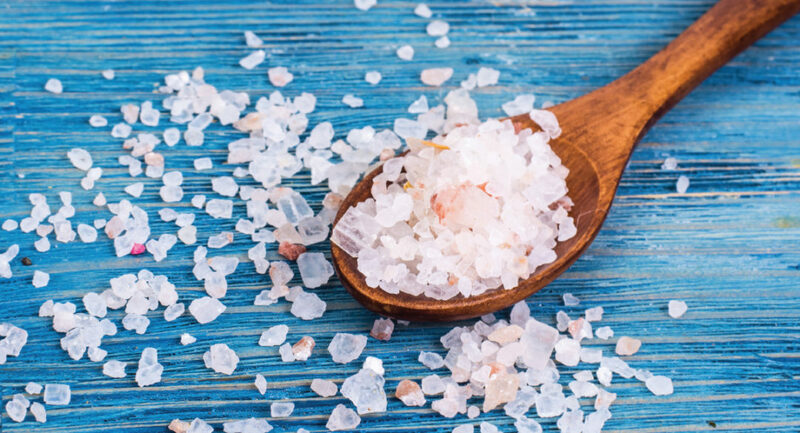 Whereas processed salt has been stripped of all its nutrients except sodium and chloride, then chemically cleaned and bleached, natural salts are full of much-needed minerals. Natural salts are rich in iodine and contain trace elements of minerals like sulphate, calcium and potassium. They also contain less sodium than processed salt. Not only is natural salt ok to consume, it’s actually vital to health. These minerals help the body to hydrate, lower blood pressure, balance PH and help to reduce acid reflux. They also improve circulation, prevent muscle cramping and strengthen bones. A meta-analysis, combining results from a number of studies, in the American Journal of Hypertension says that both a low and excessive sodium diet are associated with increased mortality. The analysis found that we really need to have an intake of between 2,645-4,945 mg per day if we do not want to have raised blood pressure levels. This means that a healthy daily intake of at least two teaspoons of salt is necessary to meet the minimum requirement to keep blood pressure at bay. This is twice the amount recommended by the British Heart Foundation and American Heart Association. I shall therefore continue to enjoy my salt guilt free. Avoid processed foods which contain large amounts of processed salt. Instead eat whole fresh foods with added natural salt. There are many natural salts to choose from: pink Himalayan, sea salt, grey or celtic sea salt, fleur de sel, black lava salt, red and Persian blue. So, which is the best? It’s believed that the pink Himalayan is the purest and least polluted salt on earth due to coming from a pristine environment surrounded by snow and ice. While natural salt does contain potassium and magnesium, there is not quite enough for electrolyte balance. It’s therefore important to make sure we get plenty of potassium from our diet (vegetables) and to consider taking a magnesium supplement. 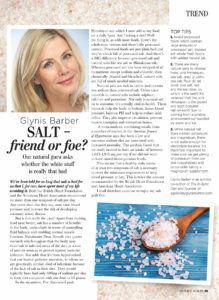 Natural Health – Salt: friend or foe? I agree we need salt in our diet. I was watching my consumption of salt for my healthy eating. I ended up having a seizure and going into hospital for a week due to low sodium levels in my blood. I was also drinking too much water and flushing the sodium out of my body. Now I have a better understanding of salt intake and reduce my water intake and feel better. How interesting, I too used to hardly use salt afraid it was not good for you but living in France I’ve discovered some great Fleur de sel from the Camargue. I’m using one with basil+tomato at the moment, you need the smallest amount. I also use an organic sel Marin with herbs+veg, again you don’t need much. Glad you’ve confirmed other articles in the past that I’ve read, makes me feel better!